26.XI.2003 ? Beelphegor (guitars, vocals, programming) and Mathias (guitars) create their own band ? Hromovlad. After some problems with rehearsal places has been finally recorded (august 2004) first instrumental promostuff titled as ?Promo 2004 ? instrumental version?. One month later, Mysticus (bass) joined the band. In october 2004 has been recorded three track material ?Krv z p?dy zroden?? destined for 3way split Algor/Korium/Hromovlad called ?Heathen Brotherhood?. In october 2005 Hromovlad went to Vrana studio to record their first full-lenght album. This album is finally recorded with live drummer Slavfist from Algor. From this moment is Slavfist fourth member of Hromovlad. 17.X.2005 ? the second gig of Hromovlad. Apocalypsa Fest VII ? Brno, Czech Republic. 20.X.2005 ? Long Ago Records releases long-awaited debut CD of Hromovlad ?Vladca lesov, skalnych stien? limited to 1000 pieces + then also limited t-shirt with album design. 11.II.2006 ? another superb gig, Under Blasphemous Banner III. in Bialsko-Biala, Poland. 17.VI.2006 ? first biggest gig in Slovakia ? Perunica Fest I. in Nitra. In august 2006 band went to Vrana studio again to record 2 coverversions + 1 own song for prepared tributes to Masters Hammer and Burzum. 11.XI.2006 ? another gig, Extreme Metal Night II, Kysucke Nove Mesto, Slovakia. 16.XII.2006 ? last live performance in this year, Metal Swamp no.28, Brno, Czech Republic. In the beginning of march has been released Live DVD of Metal Swamp 28, live performance with some black metal hordes include Hromovlad. In the same time, there were released through ukrainian label Stuza Productions tape version of our debut ?Vladca lesov, skalnych stien?. It has profi fullcoloured cover and it's limited to 500 pieces. 31.III.2007 Hromovlad played at Legalize Murder fest 1 in Zlin (Czech republic). In april 2007 has been finally released by Ravenhearth productions a long-awaited Golden tribute to Master's Hammer with czech and slovak black metal hordes. Our part in this masterpiece is coversong of ??ern? Svatoz??? and one own song called ?Brie?denie.? 5.IV.2007 ? another great gig Apocalypse fest 9. in Trencin (Slovakia) along side with romanian legend Negura Bunget and some other bands. 4.V.2007 ? We were a part of In The Name Of Old School 1. live performance in Bratislava along side with magnificent hordes as Besatt (Pol), Morrigan (Ger) and Mortuary Drape (Ita). 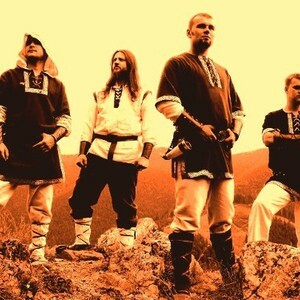 In august 2007 Hromovlad went to Musae Polymnia Studio to record of material for their second album "Oh?a hlad, vody chlad" - "Hunger Of The Fire, Cold Of The Water." 23.IX.2007 Hromovlad played in Nitra (Slovakia) with italian band Tundra. 20.X.2007 another gig Headbang Fest 1. in ?ilina (Slovakia). 10.XI.2007 ? german label Ketzer Records releases a long-awaited second album "Oh?a hlad, vody chlad" - "Hunger Of The Fire, Cold Of The Water" limited to 2000 pieces. 22.XII.2007 - another gig Apocalypsa Fest XII. in Ostrava (Czech republic). 19.I.2008 Hromovlad played in legendary Rock Klub Tartaros in Bansk? Bystrica (SR). In 2008 Hromovlad played on Dunkelheit fest 2008,in Michalovce(september),on Mater slavorum 1(november),on Metal swamp No.36(december). In april 2009 has been finally released by Ketzer Records a long-awaited Split CD ?Hromovlad / Slavigrom ? Perperuna.? On the present Hromovlad prepares material for their third album. It will be issued under the wings of czech label NAGA PRODUCTIONS. The new album is totalled in cooperation with the new band member, who is the accordion player.